The ERA Window Bolt is suitable for most types of wooden windows including casement, side hung, top hung and sash windows. Simply press the spring bolt to lock and use the key to unlock. A choice of finishes are available. Plugs conceal and protect the fixing screws. The rotating steel bolt resists hacksawing. The ERA Window Bolt is available with either a cut or standard key. Body Size: 40 mm x 22 mm x 26 mm. Supplied as one bolt + Key. 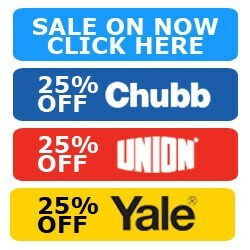 Suitable for sliding sash windows, Available in standard or cut keys versions. Rotating steel bolt resists hacksawing, supplied c/w keep plate and fixing screws. Hi, guys. My name's Darrel and I'm head of the tech team here at LocksOnline.co.uk. Thanks for taking some time to tune in and have a look at one of our product review videos. 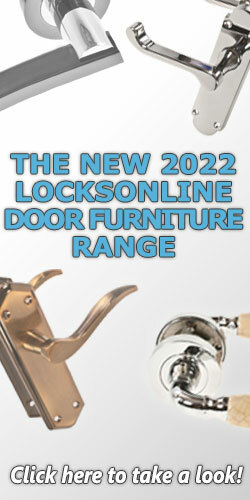 And today we're talking about sash window locks. 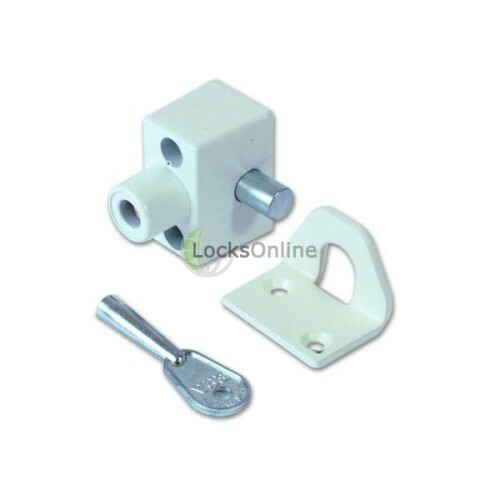 It's the Era 803 Sash Window Lock that we have available on our website. And this is the actual window lock here. It's designed for sash windows. You know, the windows that you've got which you lift up and down, the old-fashioned style windows that you may have in your property. And the idea is that these would sit on, this would sit on the outside leaf, this would sit on the inside leaf and effectively when the actual two sashes are closed together, they would then push that bolt in and it would actually lock this to the other one, and stop the actual window from dropping down or this window from going up. Now, the idea is quite simple. They've got a key in here. If I put a key in there and give that a turn, like that, and that pops that away like that. And when I then decide to lock the windows, I push that in there and that would effectively then push all the way through and stay into the keep like that. So, that's basically the function of how it works. 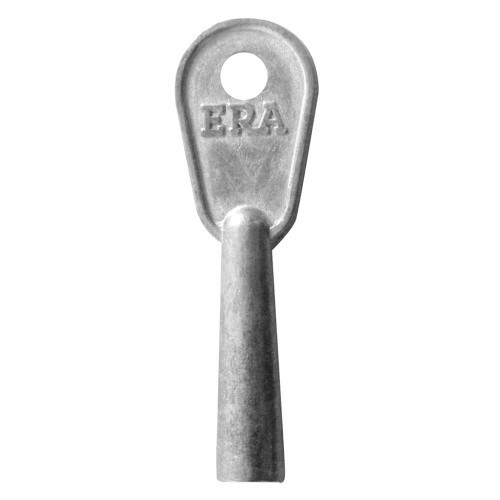 Era has this universal style key that can be used on quite a few different types of Era locks. 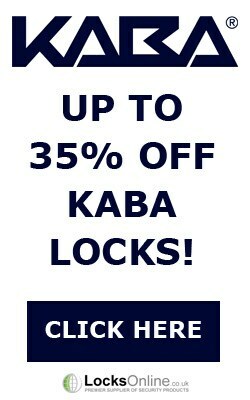 So if you've got different styles of windows, then you could get in with having the same key, which would be great for locking and unlocking them. 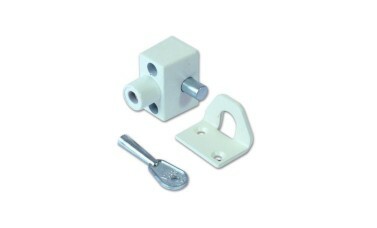 Now, when it actually comes to actually fitting things to the actual window, they come with a set of prison screws that could be used then to stop anybody undoing them. They got this special head on them that allow you to screw in, but it's hard to actually screw back out. Okay. So that's quite important. And it's got these little covers then that sit over this, like that, to finish the job off lovely and tidy. They're available in two different finishes. This is the white veering, and of course they're available in a brown finish as well and they're available on our website. What I'm going to do is give you some quick little measurements because if you're thinking "Oh, that's ideal. That is exactly what I want to do," how much space do you have on the top of your sashes for us to fit these? So let's get some measurements for you. The actual base there, the plate of it there, is 23mm. The width there is 40mm. So the fixing centres are virtually in the centre there. So this fixing centre there is about 11mm, 11.5mm. 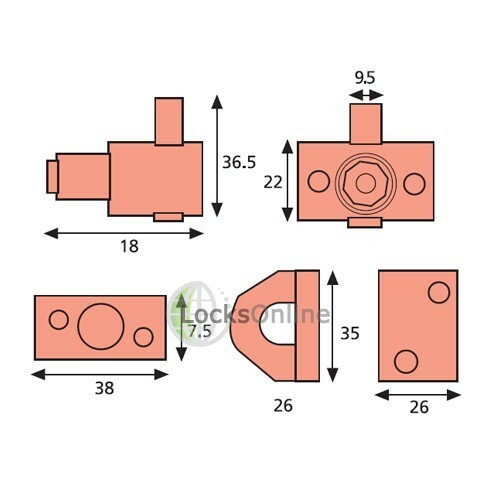 The bolt projection is 11mm. The plate here, which would obviously go on the outside sash, the footprint of that there is, if I do it to the end of the metal there, is 25mm. And of course the fixings there are sitting off centre there. If I was to get that measurement off the back of it, you're looking at 6mm. And using the back as your datum there, you've got then 15mm to the centre of that screw hole. The hole here, in which the bolt goes into, is pretty flexible. You can see here, if I was to put it like that, you can see that there's a degree of flexibility there. So if you've got a bit of misalignment, then you've got that degree of flexibility, and I'm going to be saying that there's a good 5mm of flexibility there, should you want it, if it doesn't sit right, if your sash windows are quite old. So there you go, guys. It's available on our website. 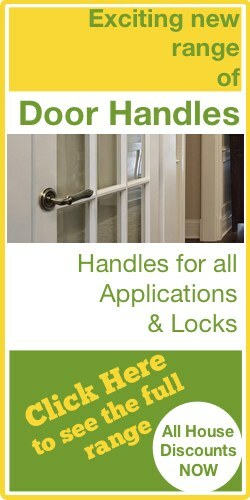 It's the 803 Era Window Sash Lock and it's available from us, LocksOnline.co.uk. Listen, if you need a bit more information or you want a bit more of advice, by all means pop online. Use the live chat that we have on our website, it's totally free. You can talk computer to computer. You can have a chat with me if you like, like Messenger used to be many years ago. Or by all means, just pick up the phone, do it the old-fashioned way, and give us a call or pop us over an email. Either way, we'd love to hear from you and, more importantly, we'd love to see you as a customer. So from me, Darrel, and all of us here at the team, take care and we'll catch up with you real soon. Bye-bye now.